I really like Japanese Shinto Shrines. Wooden buildings and lots of nature around them. They are usually found somewhere on the side of a mountain or deep in the forest. You can feel the earth breathe there. 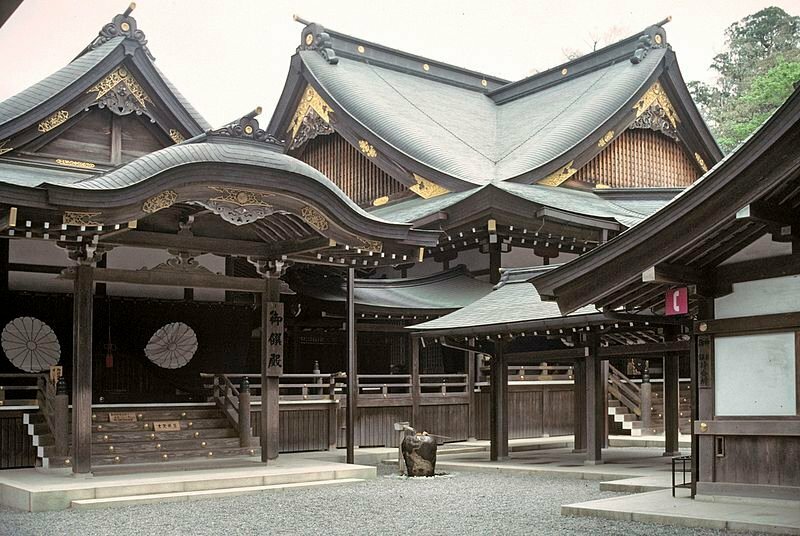 Since the earliest times, the Japanese were worshiped the huge pantheon of the Shinto gods. We can find them in the mountains, in rivers and at sea. The Japanese visit the shrines to seek the blessings of the deities and thank them for their fulfilled requests. When we cross the gate of the temple, we leave the outside world and gradually enter the holy place. In addition to the Shinto temples in Japan, there are also many Buddhist temples. They may seem quite similar, but the object of worship is different. The Buddhist temple contains images of the Buddha and transmits Buddhist teachings, while in Shinto, the essence of the Japanese deity is in the temple and is worshiped by the Shinto priest. Shinto Shrines throughout Japan attract crowds of worshipers. Many Japanese visit shirines during various important events in their lives. For children there is a ceremony called Shichi-Go-San. There are prayers for healthy growth of boys aged 3 and 5, and girls aged 3 and 7. During the wedding ceremony, couple thanks the gods for the fact that their met and promises are made that they will create a family together. Students come to pray for good results in entrance examinations. They write their prayers on wooden tablets, which often contain the name of the school they want to get to. Shrine is a place of worship of the deities of the Japanese Shinto faith. It is said that there are about 80,000 shrines in Japan inhabited by many different gods. One example is Ise Jingu in Mie Prefecture. This ancient temple is very important and appears even in Japanese mythology. It attracts six million visitors annually from all over Japan. It belongs to the Japanese goddess of the sun Amaterasu Omikami. Ise Jingu also has 125 subsidiary shrines to worship different deities. They are associated with everything from food, clothing and shelter to industry, water and wind. This is the inner shrine where Amaterasu Omikami is located. No one is allowed in there. It is a holy land, so prayers can only be offered from a distance. Visitors can see only a piece of the temple protruding outside the fence. This inaccessibility increases the seriousness and sanctity of this place. 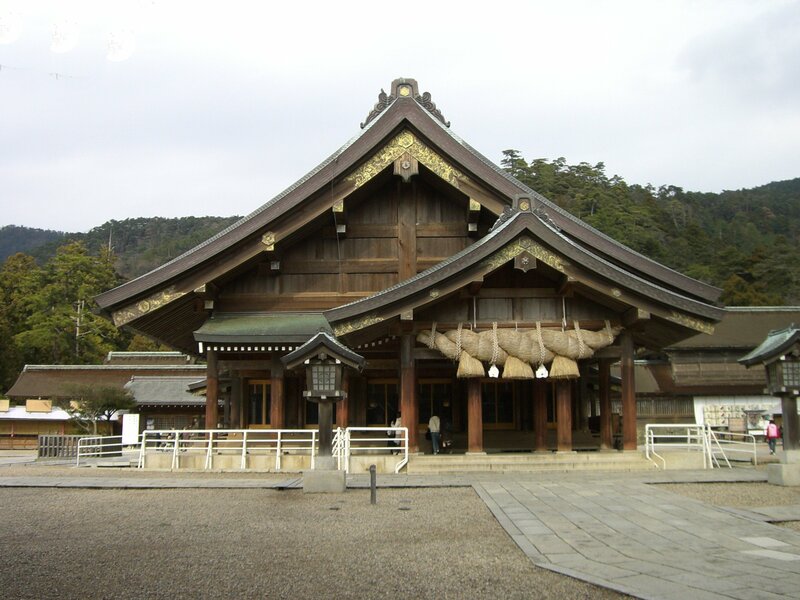 Izumo Taisha in Shimane prefecture is one of the oldest shrines in Japan dedicated to the cult Okuninushi no Mikoto. The deity, who is said to have played a role in the birth of the Japanese people, and is also known for the unification of people. Some gods are historical figures who have been deified. In Kyoto there is a temple called Kitano Tenmangu. Sugawara no Michizane, who lived more than 1,000 years ago, is worshiped here. He was an exceptionally talented scholar and politician. Later he was deified as a god of science. Every year during the exams, students come here to pray for the help of the deity. Unlike monotheistic religions, there are many gods in the Japanese Shinto. Each of them has its own unique features that allow people to choose a matching deity, and thus also temples. There are many different Shinto shrines in Japan, but all of them consist of a few basic elements and there are certain rules. I would like to show you around the shrine now. Perhaps you will someday want to fill the Shinto ritual yourself? The first thing you will see is the gate, which is called Torii. Torii is a symbol of Shinto shrines, just as pagodas are a symbol of Buddhist temples. They define the boundary between the everyday world and the holy home of the gods. Behind Torii there is a holy land, so you should bend lightly to show your respect. Torii of Heian shrine in Kyoto. Look at this car! A path or stairs lead from Torii to the main Shrine. This path is also used by deities, so you should go sideways to avoid going into the way of the deities. Then there is a pair of statues. They are usually guard dogs that protect gods and drive off evil, but in some shrines there are also other animals, such as foxes and bulls. A bit further it is a place of purification. Here, the impurities of everyday life are washed away before you can approach the gods. First, take the vessel in the right hand and fill it with water. Pour water on your left hand to clean it. Then switch the ladle over and wash the right hand. Rinse the mouth with water from the left hand and finally put the vessel in an upright position so that the last drops of water wash the handle. This protocol derives from the ancient custom in which people purified in rivers. After cleaning, you can go to the prayer hall, where prayers are offered. There is an offering box in which you should drop some coins. Making an offering removes sin and impurity. Then ring the bell that hangs at the front, the sound of bell summons for the gods while dispelling evil. You should bow twice, clap twice, and then you can offer thanks and pray. At the end, one more bow and ready! Shrine is a place where we offer prayers, we purify the body and soul so that we can continue our daily life felling refreshed and renewed. The most important element in the Shinto is the purity of the heart, and therefore there are various cleansing rituals that are performed during a visit to the shrine. Before we can make requests to the Gods, we must cleanse ourselves of the various impurities of everyday life and restore our heart to a pure state. In the Shinto shrines, you can also buy amulets that bear the name of the temple or its deity. These items have been ritually cleansed by shrine priests and are blessed with a spiritual connection with the gods. You can carry amulets with you every day. Over the centuries, shrines in Japan underwent various transformations. At the very beginning were natural deities. The mountains, rivers, rocks, trees were worshiped because it was believed that the soul lives in them. Over time, people began to build temporary altars to be able to use them during festivals. Then contemporary wooden shrines began to be created. Shinto shrines are rooted in the cults of ancient Japan. They are also closely related to agriculture. Rice has been the basis of life in Japan since ancient times. It is believed that the harvest of rice is a gift of deities that control natural forces such as sun and rain. To this day, rituals are carried out in shrines, including prayers and thanks for the abundant harvest. Japanese shrines were created thanks to the combination of Shinto and other religions. In the sixth century, Buddhism came to Japan along with the technology of building temples and Buddhist statues. Under the influence of this, people began to erect shrines to local deities, but a different style of building was adopted than in the case of Buddhist temples. Architecture was based on elevated structures that have been used in Japan since prehistoric times. Over time, the deities worshiped in Shinto and in Buddhist temples have gradually merged and for centuries Shinto and Buddhism have been symbiotic. In the nineteenth century, it was decided to separate Shinto from Buddhism, but to this day you can see in the temples the remains of those times, such as a pagoda in the Shinto shrine or an altar for a deity in a Buddhist temple. Shrines were closely related to the travels and pastimes of Japanese ordinary people. To this day, festivals and celebrations are organized in them. They are prepared by local residents, which greatly binds the community in the area. Shrines connect people for a common purpose. In addition to thanking the deities and making offers, it is also time for entertainment. In the shrine there are stands with festival food, people eat, drink, dance and sing. Shinto is a very open religion, everyone is welcome. It doesn’t require a number of rules and obligations, nor does it provide for eternal penalties. The most important thing is to be a good person, respect what is around us, and therefore not only other people, but also the nature. The Japanese have for a long time been inclined to absorb external influences and convert them into their own needs, which may partly result from the openness of Shinto beliefs. Perhaps they don’t spend long hours in shrines, however, their spirituality can be seen in everyday life.